Is Amboise the "perfect Loire Valley château town"? It certainly seems to be—and with the tomb of Leonardo da Vinci as well. 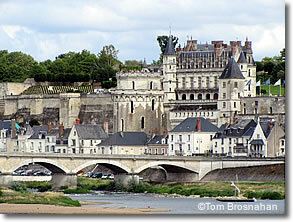 Amboise, 210 km (130 miles) southwest of Paris (map), meets the definition of a perfect château town in the Loire Valley. Not only does it have a wonderful château favored by François I, one of France's greatest monarchs, the château contains the tomb of Leonardo da Vinci, and another château that was his home for the last three years of his life. It offers a fine medieval main street, a Loire River promenade, boat cruises on the river, bicycle paths to other châteaux, good cafés, restaurants and patisseries, vineyards and wineries just out of town. and the Loire River at its feet.